Fall is an exciting time as children begin the new sports season, but it’s also a time of injury as players transition from a summer of play to the rigors of competitive athletics. Injuries sustained in high school sports particularly can create chronic points of weakness that become re-injured in subsequent years. The feet and ankles are two of the most common locations for youth sports injuries. Here are six ways to protect your children from trouble this autumn. 1. Wear the right shoes for the sport. Basketball: Provides added support for landing jumps with thick, stiff soles and offers high ankle support to accommodate sudden changes in direction and avoid sprains. Soccer: Features studs that grab the turf to prevent slips and added toe room for kicking to avoid toe injuries. 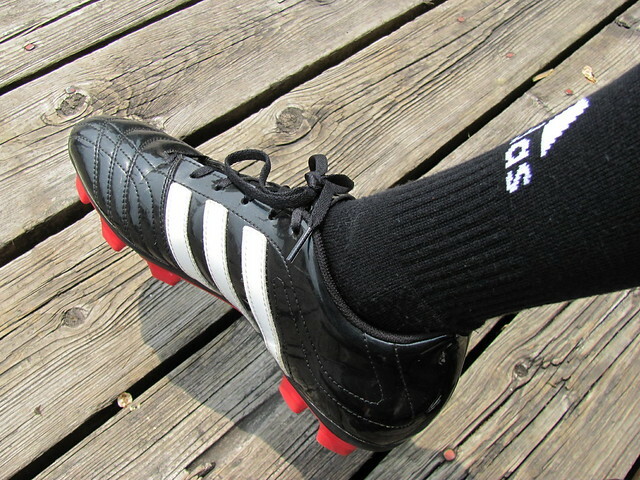 Football: Provides high ankle support for sideways motion, and traction for play on slippery wet surfaces. Running: Matches the foot arch type and includes more cushioning for shock absorption to prevent plantar fasciitis, Morton’s neuroma, and shin splints. A good physical examination should include a musculoskeletal evaluation to check for spine and knee problems. Conditions like scoliosis and Osgood-Schlatter disease can impair a child’s ability to play sports safely and should be addressed before joining a team. Electrocardiograms or echocardiograms can rule out heart murmurs and blood or urinalysis tests can check for undiagnosed diabetes. Here at The Center for Podiatric Care and Sports Medicine, we conduct computerized gait analysis, which can detect natural anomalies in a person’s anatomy, as well as abnormalities in gait while walking or running. We can then predict and prevent many types of injuries that may arise. 3. Make cross-training a priority. Kids who get too caught up in one particular sport put themselves at risk for overuse injuries by constantly engaging and putting strain on the same soft tissue and muscle groups. Stress fractures are especially common in young “sports specialists.” One study found that each hour of high-impact activity like cheerleading, gymnastics, basketball, and running increased the risk of stress fracture by 8%.2http://www.stopsportsinjuries.org/blog/entryid/36/prevent-stress-fractures-in-kids-cross-train-and-don-t-specialize-early.aspx#.VeSwt_lVikp Researchers recommend cross-training in different sports and taking time to rest to greatly decrease the risk. Good cross-training activities include biking, swimming, treadmill workouts, and weight training. 4. Remain vigilant to detect injuries early. Kids are not always forthcoming about their injuries, for fear of being removed from the game. So it’s important that you watch for limping or other signs that your child may not be performing to the fullest. Early treatment for most sports injuries simply consists of rest, ice, compression, and elevation for the first 24 to 48 hours. Most minor injuries resolve easily with the proper rest and care. 5. Assess the warm-up routine. Visit one of your child’s practices to see what kind of warm-up routine is advocated. If the practice doesn’t begin with at least 10 minutes of stretching and warming up, then teach your child these drills yourself and have him or her show up to practice a little early to prepare. The hard sprinting involved in many sports causes stretched or torn ligaments called sprains. Ask The Center for Podiatric Care and Sports Medicine to guide your child through a stretching and warm-up routine. Also, don’t forget to have your child cool down! Stretching after activity is just as important when it comes to foot and ankle injury prevention. 6. Consider custom foot orthotics to protect against turf toe. Pro athletes often recoup from injury and prevent re-injury by wearing custom orthotics inside their shoes. Insoles created by The Center for Podiatric Care and Sports Medicine conform to an individual’s unique foot structure and easily slip inside any type of shoe, including athletic trainers. We do not recommend orthotics for every child and every situation, but we are more than happy to answer any questions you may have and take a look at your child’s feet to determine whether custom shoe inserts could be an affordable way to prevent expensive medical bills down the road. The Center for Podiatric Care and Sports Medicine in New York City specializes in foot and ankle injuries with surgeons on hand to care for emergencies and a team of experienced sports medicine doctors adept in physical conditioning and therapy. Our a full suite of diagnostic tools ensures your child gets an accurate, comprehensive diagnosis the first time, while our investment in advanced therapies like platelet rich plasma, ultrasound therapy, and pulsed lasers brings you the least invasive treatment methods. Contact us to learn more about how our experienced team of doctors can help help you. » Is Diabetic Foot Care Covered By Medicaid & Medicare In New York State?